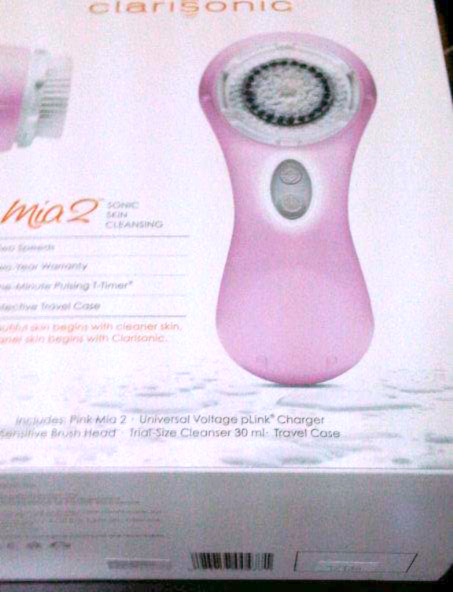 The Geeky Rabbit: A treat to end the month- Clarisonic Mia 2 in Pink! A treat to end the month- Clarisonic Mia 2 in Pink! Something that I have been looking forward to has finally arrived! Sephora had been carrying the Clarisonic Mia 2 for some time, but only the white one was available. I had been waiting for the pink version to arrive as one of the kind sales assistant had told me that it'll be coming before August 2012. I was so thrilled to see this at Sephora earlier today, and I knew I had to get it. According to the sales assistant, the pink Clarisonic Mia 2 is actually limited edition. I'm not sure about this either, but I was glad to have grabbed the last one available at the outlet I was at. The kit came with a Sensitive Skin brush head, but I decided to pick up the Delicate Skin brush as well. I tried the sample brush at Sephora and thought that the Sensitive one was pretty harsh. And that was on the back of my hand! Imagine if it's on the face, it'd definitely be more painful. I was told that the first charge takes about 24 hours, so I'm patiently waiting for it to be ready before I start using it. I'll do a full review after trying it out for some time! This is definitely something rather expensive and a great indulge for me, as I am not someone who spend a lot on skincare. Except for samples and trial kits, all my skincare are from the drugstore and I've been using my favorite Clean and Clear cleanser since I was twelve. I had a discount coupon, so it was a good deal too. However, getting this in the local Sephora is more expensive than buying it from Sephora USA. I've heard of people getting their friends or relatives to get the set from USA, and some sites offer the service of purchasing from the States too. The price difference is huge (possibly more than 25% cheaper). There are some drawbacks though. The warranty will not be valid, unless you have someone hand-carry back to the US. Moreover, the Clarisonic Mia2 that I got has the UK plug which is suitable for use in Asia. As such, it's definitely more convenient as the US one will require a converter. My Clarisonic comes with 2 years of in-house warranty provided by Sephora. I'm definitely very excited about taking my skincare regime up a notch. I don't intend to use this daily though- twice a week should do for me, as that is the frequency I had been using the Neutrogena Wave 2 as an exfoliator. A little treat for myself, and hopefully more to come to tide over the stressful and hard times! Darling! Love the pastel pink! I got the clarisonic Mia in boring white a few months ago as a possible solution for my dull acne prone face. I got it for rm 599 at klcc ugh damn ex! But worth it! !